Will past returns of mutual funds matter after schemes are merged? What’s the first thing you check before investing in a mutual fund? It’s past performance. But what if a scheme’s past performance is not relevant to what the scheme will do henceforth? That’s the question in front of many mutual fund investors these days as they grapple with dozens of emails by fund houses announcing their scheme merger plans. Last year, capital markets regulator Securities and Exchange Board of India (Sebi) asked fund houses to align all their schemes—and merge or consolidate if required—to 36 categories. Last week, Sebi issued guidelines telling fund houses how to showcase their past performances in case schemes are merged, as a result of this consolidation exercise. There are different ways in which the mergers happen. One, if two schemes with similar mandates merge, the fund house will display a weighted average performance of both the schemes. Two, if, say, Scheme A merges with Scheme B and the features of Scheme B are retained, then Scheme B’s performance will be retained. However, if the features of Scheme A are retained, then Scheme A’s performance will retained. 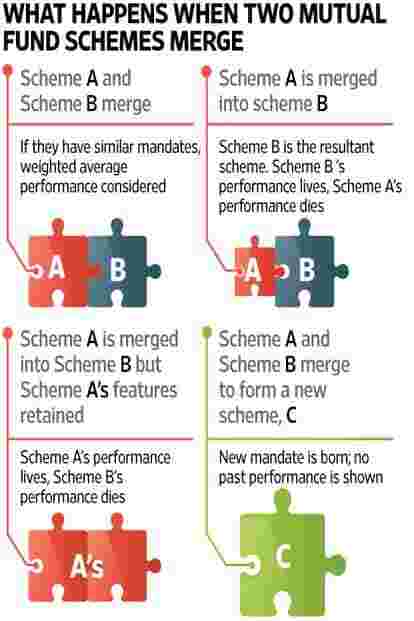 Three, if two or more schemes merge and a new scheme is born out of it (with a mandate that is different to that of the merged schemes), then this new scheme will not carry any past performance. “The weighted average method of calculating returns is a bit complicated but the mutual fund industry will display returns in this manner," said D.P. Singh, chief marketing officer (domestic business), SBI Funds Management Ltd.
One area that the Sebi circular is silent on is what will happen to those schemes that will not merge with any other, but whose mandate changes. A person close to Sebi’s thinking, on condition of anonymity, said that “fund houses should go by the principle of Sebi’s intent to this whole consolidation and scheme re-categorisation exercise and decide whether they should drop their past performance or not." Say, you have invested in a large-cap fund that has been investing up to about 30% in mid-cap stocks, and now your fund house re-classifies the scheme in the large- and mid-cap category that Sebi has created. This person said this fund would not need to drop its past performance. But if a small-cap fund gets classified as a large- and mid-cap category fund, then it will need to drop its past performance since that is a change in its strategy. How fund houses interpret this will be seen in the coming few months, unless Sebi clarifies further. “The Sebi circular is unclear on what schemes that change their mandates but don’t merge should do. It should have been more specific," said the head of operations of a fund house, also requesting anonymity. According to Dhirendra Kumar, chief executive officer, Value Research, “Logically, if a scheme gets re-classified in a new category and its fundamental attribute changes, it should drop its past performance because this results in a new scheme." Kumar pointed out to a paragraph in the Sebi circular that speaks about a new scheme being born out of a merger of two schemes and how Sebi has mandated such a scheme to drop its past performance.